There are lots of Free Shopping cart on the internet, OpenCart is one of them which is a turn-key ready “out of the box” shopping cart solution. It is very simple to install, upload this software on your server and after installation select your template, add products and you are ready to start accepting orders. It has order management and multiple payment gateways already built in and they provide lifetime free support and free software updates. There is a build-in-system for the template to switch between different free and premium templates or you can migrate the current look of your site into OpenCart. Following are the best Opencart Premium Templates from ThemeForest. This theme comes with 5 color skins. 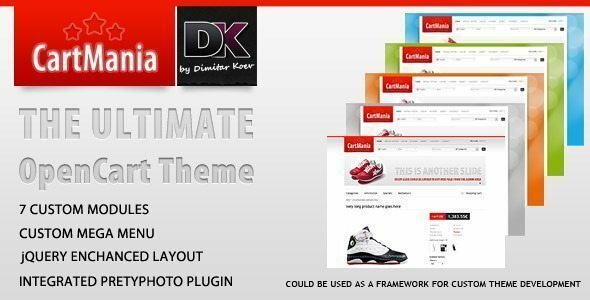 With its clean design, 7 custom modules and reworked layout it is suitable for both direct use or custom theme development. Recommended to use on a clean install or existing shops without system core modifications! 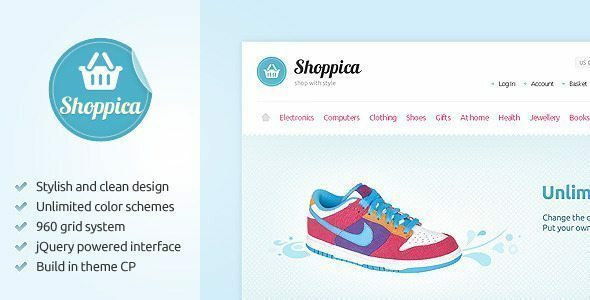 Shoppica is a stylish premium OpenCart theme (currently supported versions are 1.4.9.3/1.4.9.4/1.4.9.5). The clean and modern design allows you to use the theme for every kind of online shop. In combination with the powerfull option to change all the element’s color, Shoppica theme give you the possibility to make a unique e-commerce website that stands out of the crowd! 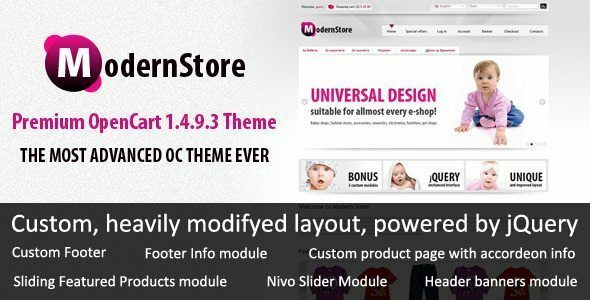 ModernStore is a very advanced premium theme for OpenCart 1.4.9.3./1.4.9.4/1.4.9.5 The modern and universal design is suitable for almost every e-commerce site: kids boutiques, fashion stores, accessories, cosmetics, electronics, furniture or pet shop. 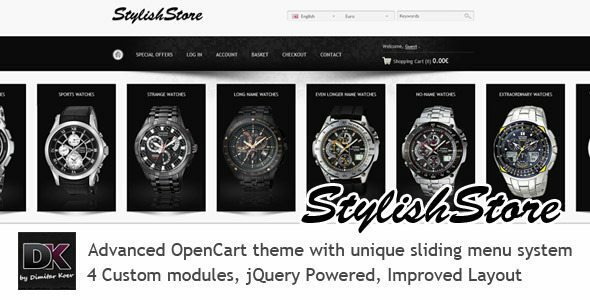 StylishStore is a very advanced premium theme for OpenCart 1.4.9.3./1.4.9.4/1.4.9.5 The modern and universal design is suitable for almost every e-commerce site: kids boutiques, fashion stores, accessories, cosmetics, electronics, furniture or pet shop. 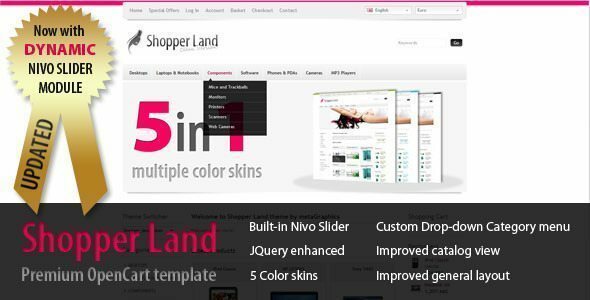 Shopper Land is a 3 column, premium OpenCart 1.4.9.3/1.4.9.4/1.4.9.5 template with a custom Nivo slider module, custom category drop-down module and improved, jQuery powered catalog layout. This template comes with 5 color skins – Default Clean Version (pink accents), Blue, Green, Orange and Black. Vasco theme has just been updated. I fixed some of the bugs reported by its users and also added nivo slideshow module, so now to add/ edit/ delete a slide you don’t need to edit any html. All you have to do is log in to your admin panel and upload your slides, add links and set settings. My Stock Image Shop Opencart Template helps you to sell stock stuff online using OpenCart e-commerce cart, the template works with latest version 1.4.9. Template best suits to sell stock images, e-books. 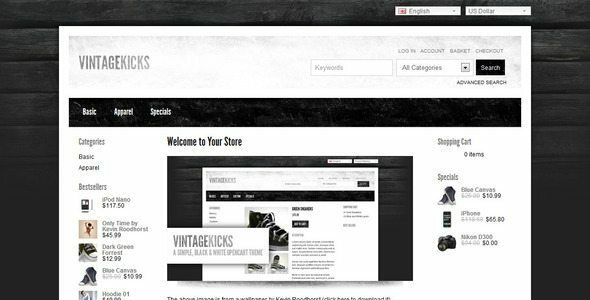 Vintage Kicks is a 3 column, simple theme for OpenCart. It breaks away from the usual default-looking Opencart theme, and much of the code has been reorganized and cleaned up for better, easier editing. Skylight is a simple, beautiful and elegant template design for the powerful open source shopping cart system OpenCart. It was made for OpenCart 1.4.9.1 – the very latest version only recently released. OpenCart is quick and easy to setup and you can install this template in a matter of minutes. Skylight works with all modern browsers and is enhanced by the Google Font API. Please comment with any bugs or issues and I will endeavor to address them as soon as possible. Feel free to contact me from my profile page with any questions regarding OpenCart setup, development or support. Darkwood is a clean and elegant template design for the powerful open source shopping cart system OpenCart. Darkwood was made for OpenCart 1.4.9.1 – the very latest version only recently released. OpenCart is quick and easy to setup and you can install this template in a matter of minutes. Set products to a appear in specific stores. Localize each store by setting a different default language, currency and tax class. Setup a default customer group for each store allowing you to have some stores set up for retail customers and others as wholesale. Arvixe is simply the best OpenCart hosting solution available. They are providing customized script hosting since 2003. They serve thousands of customers worldwide with their lightning fast optimized servers, high-performance fiber-optic networking, extremely high reliability and 24/7/365 friendly expert support. 24/7/365 Live Chat, Phone and Email Support.